The following chart compares on a logarithmic scale gross cumulative values of $1 initial investments in SPTR, BXM, PUT and CLL at the end of June 1986. BXM tracks the underlying SPTR fairly closely, except after extended bull market runs. PUT sometimes outperforms and sometimes underperforms SPTR, and CLL generally underperforms. Results suggest that the premium carried by index put options is larger than that carried by index call options. 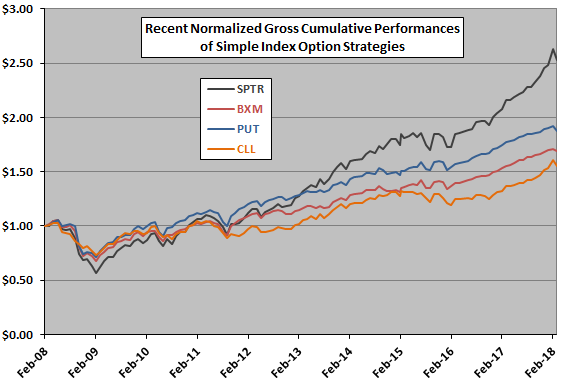 CAGRs for SPTR, BXM, PUT and CLL are 10.3%, 8.9%, 10.0% and 6.8%, respectively. MaxDDs are in the range -33% to -36% for the option strategies, compared to -51% for SPTR. As a robustness test, we look at a recent subperiod. 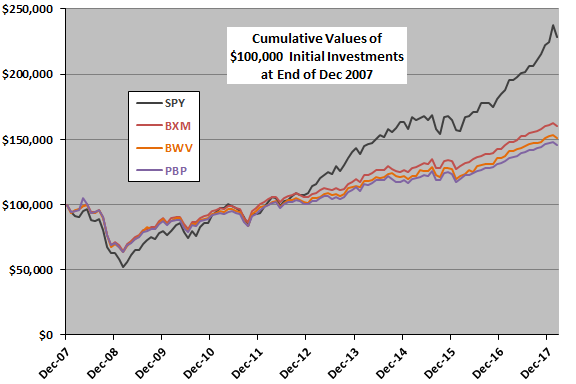 The next chart compares the gross cumulative values of $1 initial investments in SPTR, BXM, PUT and CLL at the end of February 2008. Results for the last ten years generally confirm those above for the entire sample period. During this subperiod, CAGRs for SPTR, BXM, PUT and CLL are 9.7%, 5.4%, 6.5% and 4.5%, respectively. For a different perspective, we look at monthly return statistics. 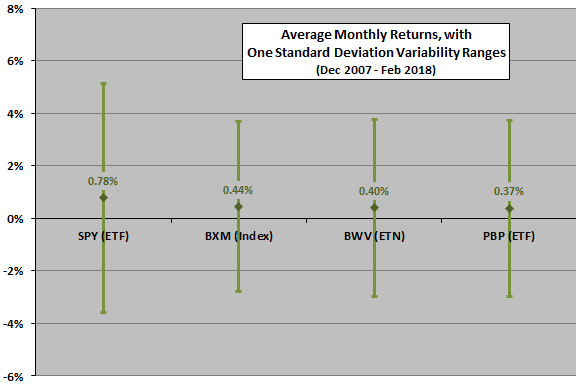 The next chart compares average gross monthly returns for SPTR, BXM, PUT and CLL over the entire sample period, with one standard deviation variability ranges. PUT again appears most attractive, with relatively high average gross monthly return and relatively low standard deviation of monthly returns. Ratios of average monthly return to standard deviation of monthly returns for the four series are 0.21, 0.25, 0.29 and 0.20, respectively. For more realistic performance of the covered call and put option strategies, we switch to two ETF/ETN implementations of BXM. BWV and PBP underperform BXM, reflecting the costs of implementation (trading frictions and management fees), currently 0.75% per year for each. BWV and PBP substantially underperform SPY, undermining belief that an index covered call strategy outperforms buying and holding the underlying index. BWV and PBP do reduce MaxDD during the 2008-2009 financial crisis (-36% and -40%, respectively, compared to -48% for SPY). 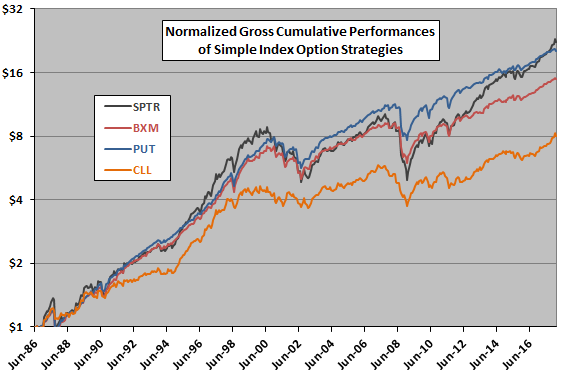 Option strategies are less volatile than the underlying index. Standard deviations of monthly returns for the option strategies are 3.37% and 3.36%, compared to 4.35% for buying and holding SPY. Average monthly implementation costs for BMV and PBP relative to the ideal BXM are about 0.04% and 0.07%, respectively. Ratios of average monthly return to standard deviation of monthly returns are 0.18, 0.12 and 0.11 for SPY, BWV and PBP, respectively. 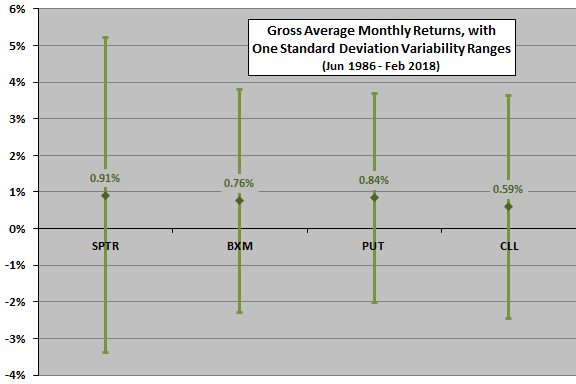 Correlations of BXM, BWV and PBP monthly returns with SPY monthly returns are in the range 0.85-0.89. How do returns vary by market state? 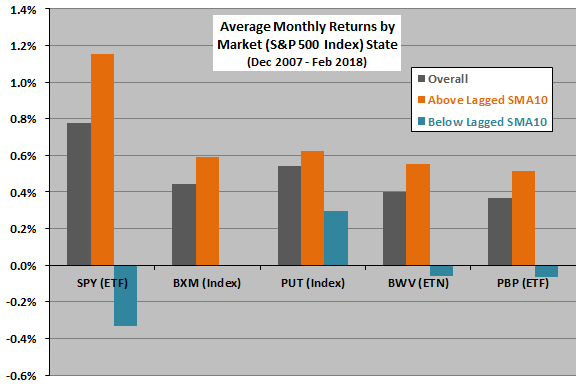 All assets/indexes perform better when the prior-month S&P 500 Index is above SMA10 (bull state) than below (bear state). Only PUT generates a positive return during the bear state, perhaps due to highly elevated put option premiums in this state. However, this return is gross of frictions and fees. Assuming 0.2% one-way trading friction, no return on cash and no tax implications of trading, holding SPY (cash) when the prior-month S&P 500 Index is above (below) SMA10 materially outperforms the simple index option strategies based on CAGR (10.1%), monthly return statistics (return-standard deviation ratio 0.32) and MaxDD (-13%). In summary, evidence from simple tests offers little support for belief that simple index covered call strategies are preferable to buying and holding the underlying index. Selling cash-covered index put options is potentially attractive. As noted, use of indexes with no accounting for implementation costs tends to overstate expected performance. As noted, the sample period for the ETF/ETN implementations of BXM is short, especially in terms of number of bull and bear markets. There is also WisdomTree CBOE S&P500 PutWrite Strategy (PUTW) for comparison with PUT, but the available sample is extremely short. Over this sample, PUTW has slightly lower cumulative return than PUT. Simple option strategies executed with narrower indexes, individual stocks or other assets may perform differently. See also this past live test of selling cash-covered index put options.